This year Chris and I did a little more Halloween decoration than usual. 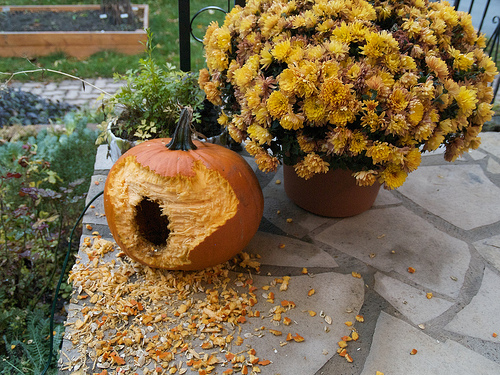 I had bought a couple of beautiful pumpkins a week ago, and made the mistake of leaving them out on the porch to be admired. Well apparently a couple fuzzy little black creatures enjoyed admiring them too. 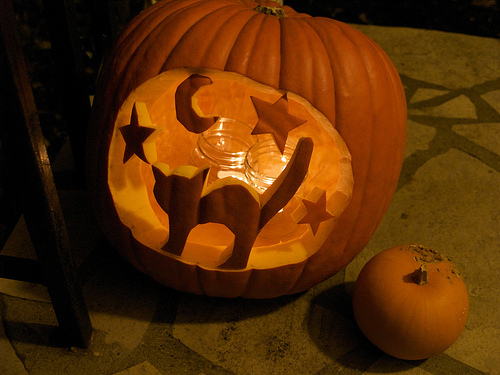 So I had to go out and get me a couple new pumpkins so that I could do the jack-o-lanterns. We also put up some orange LEDs, a big tarantula on the door and this really cool jelly stuff that sticks to the window and looks like blood dripping down the glass. It reminds me of The Shinning. Chris set up a projector to shine spooky lights behind our glass door, and then to top it all off, we got a fogging machine. Some of the kids who came to our door thought our house was on fire! 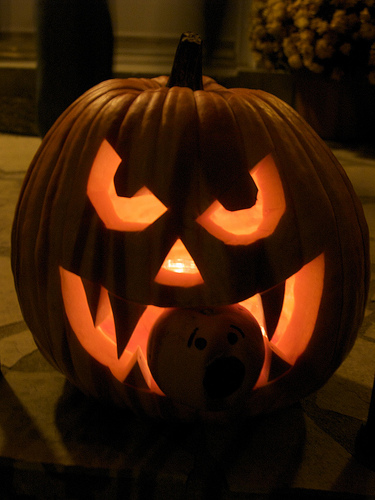 I used one of the little tiny pumpkins I grew this summer inside the mouth of this big jack-o-lantern, and it was such a hit! Thanks for the idea Interwebs! Previous Post And the relay begins!